Love battling against the sorcery of the jungle! If art acts as a cultural mirror, then horror especially acts as a demented funhouse that refracts and reflects contemporary societal fears. When held up to the era that spawned horror cinema, the camera captured a recurring Western unease towards the exotic. The world was a much bigger, more unknown commodity as recently as 80 years ago, so it stands to reason that audiences frequently recoiled at the thought of the horrific nooks and crannies buried away from civilization. Of course, it unwittingly reveals a staggering ignorance now, especially since the exotic is almost always conflated with an unseemly, xenophobic take on Otherness—in many cases, it would be disingenuous to even call this subtext. 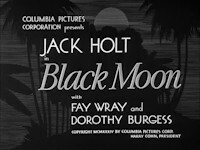 Hell, it’s right there in the title for Black Moon, another film that especially reveals the hysteria surrounding voodoo, particularly its insidious ability to corrupt lily whiteness. The lily here is Juanita (Dorothy Burgess), a housewife with a bizarre history. As a child, she once resided on a tropical island before she was “rescued” and brought into high society. Despite a happy marriage to Stephen Lane (Jack Holt) that's produced a healthy child, she can’t resist the urge to return home. Between her intense longing and her sudden penchant for tribal bongo music, it’s almost as if he’s being compelled there by some force. Against the wishes of her husband, Juanita returns to her native land, where the locals still engage in mysticism and rituals, much to the dismay of travelling secretary Gail (Fay Wray), who winds up contacting lane in a last ditch effort to save everyone’s lives—and perhaps their souls. Obviously, there’s no getting around the elephant in the room –this is early Hollywood, so you’ve got to treat Black Moon like that ignorant, elderly relative that was raised during a different age and doesn’t know any better. Even though you accept it, you still squirm on the couch whenever it opens its mouth. The film can’t even be considered casually racist, what with its aggressive depiction of natives as godless, murderous savages. It doesn’t even wait for the main characters to reach Saint Christopher to do so, as one of them shows up to assassinate an emissary (carrying a warning for Juanita) with a blow dart. The lone black character who isn’t a savage is a boat pilot (Clarence Muse) who is one step removed from a cartoon, of course. It’s uncomfortable, but it’s also not all that uncommon for this era either, as Black Moon is a stopgap between White Zombie and I Walked With a Zombie, though it may be the most brazen of the three in its insistence that nothing could be more horrifying than seeing a white woman fall prey to black culture, here written off as an anonymous, sinister tribe who wrongfully rise up against white oppressors, who are well within their rights to quell the rebellion with force. One scene finds one white guy fawning over the hidden, well-stocked armory that can serve as a last resort if they ever need ot mow down the locals (did I also mention the film opens with a prominent NRA ad?). While it purports at being a mystery, Black Moon is hardly coy, as Juanita has obviously been implanted with some sort of voodoo curse that has unwittingly turned her into a sleeper agent for the natives. Essentially, the horror here involves watching a guy lose his wife to a whole bunch of black guys, just in case you were wondering how subtle the film is. And the wild part is that it actually happens despite his and Juanita’s uncle’s (Arnold Korff) best efforts to save her. Perhaps not so shockingly (this one may have arrived just on the outskirts of the Hayes Code’s full adoption), she becomes a voodoo queen, and the film only becomes weirder and bleaker from that point. 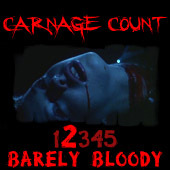 Priests engage in ritual sacrifice, children are abducted, and Lane is forced into a precarious position at the film’s outrageous climax, which only follows the Hollywood template insomuch as it features man, woman, and child drifting off towards the sunset, the black moon having settled only after unexpected bloodshed. For all its troubling racial implications, Black Moon is undeniably fascinating and serves as mildly effective horror film to boot. The obviously low budget results in a claustrophobic soundstage island jungle that’s perpetually haunted by tribal drumbeats. It’s Island of Lost Souls lite in its smothering, airless atmosphere that encloses and enfolds the main characters. Like the best films of this age, its exotic setting takes on something of a menacing presence that reinforces the heebie-jeebies contemporary audiences must have felt about these dark corners of the globe. The ominous vibe compensates for its clunky flaws, particularly the oddly structured and mostly unspoken love triangle that results in Wray mostly acting as a third wheel and a means by which to reestablish the status quo by the end of the film (while such a turn would seemingly be scandalous for the time, they probably had a provisions that allowed for breaking up marriages in the event of a possessed spouse). It’s arguable that Black Moon has just as many issues with women as it does with people of color since it’s largely framed as Lane’s struggle to reclaim the idyllic wife that he’s lost to jungle fever. Here’s a movie that features a woman victimized by a childhood curse, yet she’s brushed over and essentially turned into the villain of the piece; meanwhile, her husband gets a new girl and presumably lives happily ever after. Had Black Moon actually bothered to key in on the heartbreaking drama of a woman losing her soul to dark forces, it might have been more memorable than the admittedly bizarre (and ballsy) schlock-fest into which it degenerates. Its ending is haunting but could have been even more so if Juanita was more than just an object of the male gaze that becomes twisted and distorted by the Other. Still, I must admit to finding this sort of stuff compelling and curious, if only because it is so brazen. Black Moon might not be as artful as other films in this particular movement, but it’s a fine reflection of early tribal/third world horror. Decades later, it would develop into the cannibal subgenre, where Westerners were literally devoured and dismembered, but we couldn’t have arrived at that point without an earlier battle between voodoo, mind, and soul. As is often the case with films resting in the shadows of more championed giants, Black Moon is a bit obscure and only reached DVD a couple of years ago thanks to the Sony Pictures Choice Collection, the studio’s on-demand line that brings nigh-forgotten titles to DVD-R. As is typically the case, the disc is bare bones (there’s not even a menu), but the presentation is quite remarkable and preferable to whatever treatment the film would have likely received if it were dumped on public domain collections. Black Moon is perhaps troubling in all the wrong ways for modern audiences, but it’s also a fascinating time capsule and a strong entry in the voodoo cult canon. Buy it!